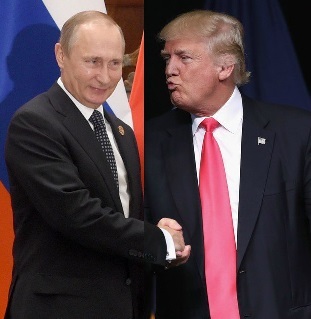 The black farce of Trump’s relations with the Kremlin roll on with a summit set for July 16th and Trump announcing that Putin has denied meddling in the 2016 elections. So that’s alright then. Didn’t happen. 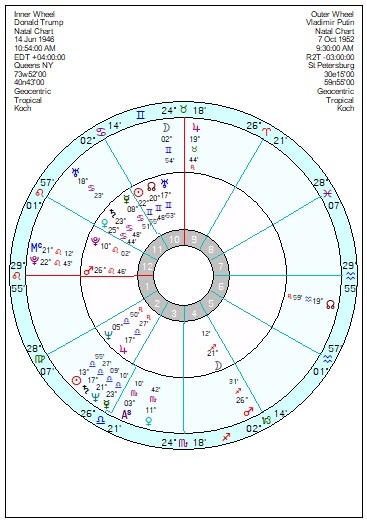 The meet is scheduled three days after the Solar Eclipse at 21 Cancer which is conjunct Trump’s Saturn Venus in Cancer and conjunct Putin’s Uranus. An Eclipse on Saturn is grow-up-time, face responsibilities, pay the price for past actions. With Venus involved it may lead to an emotional crisis, leaving him feeling bereft and alone, his guardian angel having disappeared and with a dent in his self-image. The eclipse effect runs on for several months. 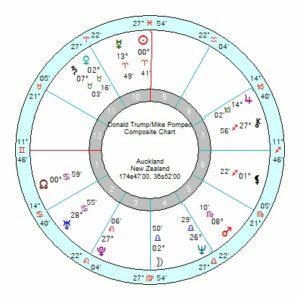 An Eclipse conjunct Uranus offers an opportunity for more freedom – and Putin is licking his lips with relish in the aftermath with tr Pluto trine his Jupiter, making him even more pushily confident than usual. Trump looks bad-tempered from early July and certainly at odds with Mike Pompeo. July was always going to be the start of a run of disagreements between them, worsening through 2019. Trump’s relationship with Putin is very enmeshed with a composite power-hungry Sun Pluto conjunction, so very much a bond with one dominant partner. If birth times are accurate there’s also a composite Yod of Sun Pluto sextile Neptune inconjunct Moon which would suggest a contact which will have fateful consequences for both. There’ll be a definite burp of tension and irritation between them from July 25th into mid August and again in October. The concern amongst Western allies is that Trump’s bro-romance will give Putin carte blanche to do as he pleases in eastern Europe, with the US seemingly intent on pulling away from NATO. None of the USA/Russia relationship charts look positive this year so the president may well be out on a limb. The meeting will most likely be set around noon in Helsinki (or Vantaa, which doesn’t change much astrologically), if that’s any help. I think that this is when Putin (whose name’s diminuitive would be Volodja, if one wants to really disrespect him) notices Trump can’t be controlled, the way one “adult in the room” after another has. Trump really believes in dismanteling NATO, WTO and EU, while at least the latter two are not Russia’s ultimate goal – they rely on oil and gas exports, and the last Financial Crisis hit them hard on this front. He might, actually, want to concentrate on corrupting more “manageable” subjects. He probably has a lot on the whole Republican Leadership, including VP Pence, through their sponsorship by NRA. Also, Salvini has practically taken over Italian Government, and he is both a Putin friendly and an able politician. Therefore, it may become desireable for Putin to drop Trump. It would be directly out of Cheka/KGB playbook, too. That is a cheerful thought Solaia, Putin dropping Trump, I mean. At some point DT’s crazy trade policies are going to come back and bite the US hard. Who will he blame when his true love leaves Trmp for another? Obama? Crooked Hillary? Sessions? I’ve actually lost interest following the news of Drompf. larryc, LOL. Maybe Macron, who refused his amazing deal for a separate trade treaty with The US if he withdrew from EU?